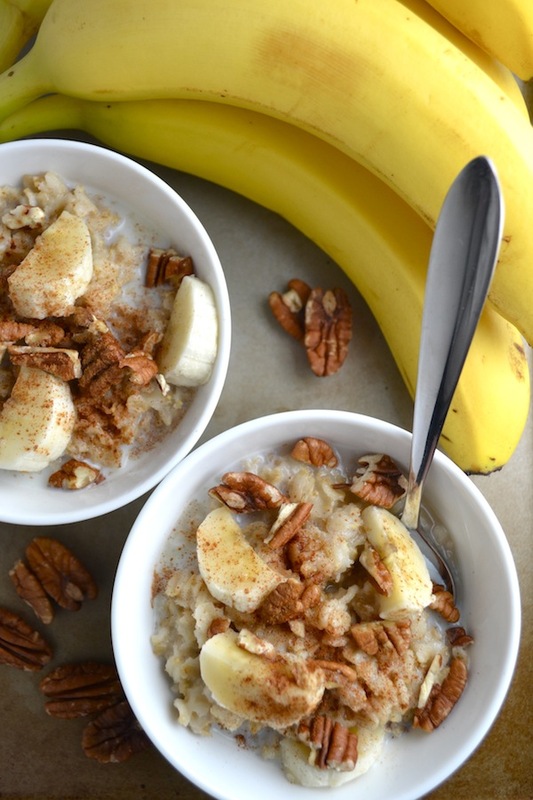 Are you ready for an oatmeal-filled fall? 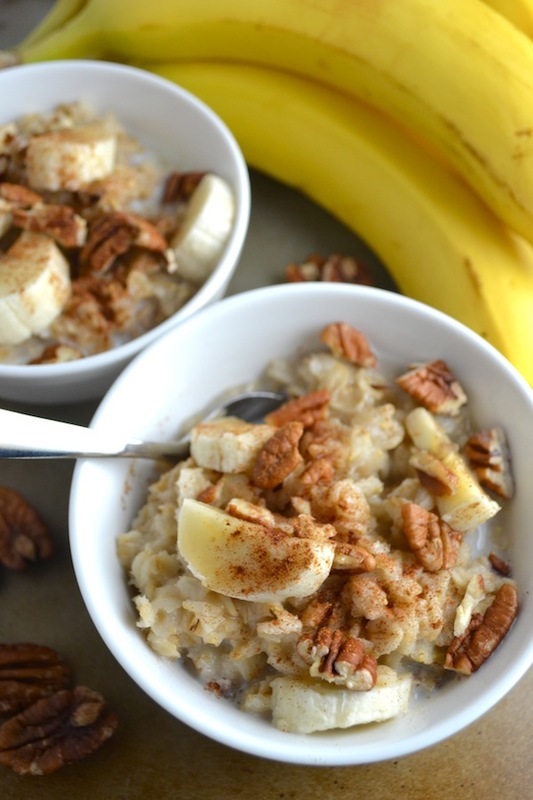 I made this banana, pecan, cinnamon oatmeal this morning. And I’m glad I did. Because it was yummy. I used rolled oats this time around. I usually like steel cut even more (check out this steel cut recipe) but my baby loves oatmeal right now and rolled oats just go down easier when you only have three teeth. You know? I soaked these rolled oats overnight before cooking them this morning. Soaking your grains helps with digestion and nutrient absorption. Read about the benefits of soaking your grains here. And then adding bananas, pecans, cinnamon, maple syrup, and raw whole milk make it healthy. And tasty. Plain oatmeal is gross. I know some people use apple cider vinegar for their acidic medium when soaking rolled oats. But I’ve found it makes the oats too acidy and I don’t like the flavor. So for rolled oats, I use naturally cultured buttermilk, whey, or yogurt as my acidic medium. I do use apple cider vinegar when soaking steel cut oats though because they don’t soak up the vinegar as much. I like Bob’s Red Mill Organic Rolled Oats or 365 Everyday Value Organic Old-Fashioned Rolled Oats. I’m sure there are a lot of other good brands for rolled oats too. I use Kalona Super Natural buttermilk for my acidic medium and Real Salt (read about the benefits of unrefined sea salt here). I buy my raw milk at Real Foods Market and…I like the Kirkland brand Saigon Cinnamon and real maple syrup from Costco. The higher-quality the ingredients, the yummier the oatmeal. Enjoy! Put the rolled oats in a glass bowl and cover with water. Add in your acidic medium and stir to combine. Let oats sit on your counter at room temperature overnight or for 8 to 24 hours. When finished soaking, put oats in a sieve and rinse with water. Bring 1 cup of fresh water and sea salt to boil in a pot. Add in rinsed soaked oats and simmer on low. Cook for 3 to 5 minutes or until oats reach a desired consistency, stirring occasionally. 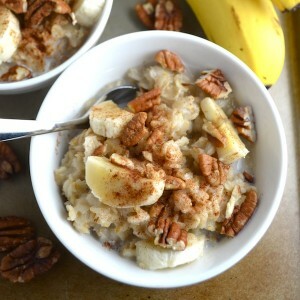 Scoop into bowls and top with cream, bananas, pecans, cinnamon, and maple syrup.